In our guest room we have a slightly wonky wardrobe. 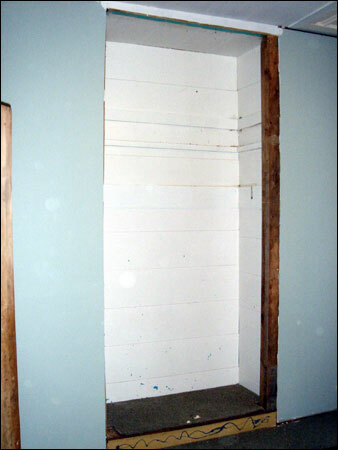 We assume it happened when the house was moved five years ago – the wardrobe isn’t square. You can see in these first two pictures, the angles at the corners don’t look quite right. The sliding doors don’t fit squarely and the cupboard at the top has the same problem. What better wet day project than to demolish (and rebuild) a wardrobe? When we repainted we removed the reproduction mouldings from around the wardrobe (they were pressed MDF and pretty unpleasant). The plan is to replace them with nicer wood mouldings when the wardrobe is finished. 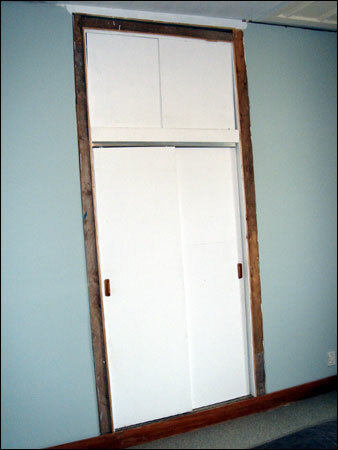 As for the painted MDF sliding doors…let’s just say they aren’t staying. Come to think of it, the wardrobe lining isn’t flash either so that will be replaced in phase 2. Here’s the wardrobe with all offending crooked pieces removed. 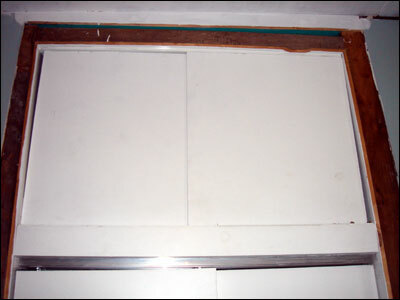 The only original piece left is the beam on the right – it is plumb – everything else was off in one dimension or another. Keep an eye out for the next rainy-day posting once I have the new mouldings and some rimu facing for the inside edges of the beams. Then it’s doors!